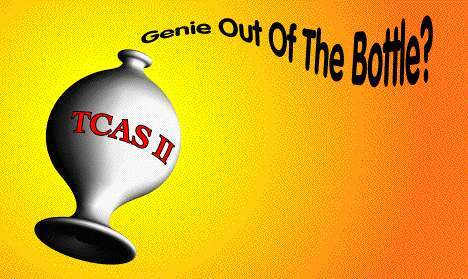 TCASII--Genie Out of the Bottle? The upsurge in TCAS incident reporting to the ASRS points to a growing controversy between flight crews and air traffic controllers. While flight crews appear to wholeheartedly endorse its use, others, specifically air traffic controllers, feel that the difficulties and teething problems of this new technology may mean that the genie is out of the bottle -- and out of control. Since 1955, the aviation community has struggled to conceive and implement an automated airborne collision avoidance system as a backup to the air traffic control system. In 1981, Administrator J. Lynn Helms committed the resources of the Federal Aviation Administration (FAA) to the development of an airborne system by 1985. Based on 1987 congressional legislation, the FAA mandated the installation of Traffic Alert and Collision Avoidance System (TCAS II) equipment on all airliners by the end of 1993. To date, approximately 70 percent of the air carrier fleet and over 400 business aircraft are TCAS II equipped. Two thousand TCAS II aircraft have flown over 2.5 million revenue miles protected by a technology that is generating discussion and even controversy among pilots and controllers. On July 29, 1992, at the request of the FAA's Office of Aviation Safety and the National Transportation Safety Board (NTSB), the ASRS provided an analysis of TCAS II incident reports. A random sampling of 170 TCAS II incident reports were coded and analyzed by a team of ASRS pilot and controller analysts in a Quick Response (QR) effort. An ASRS QR is an intensive, time-limited analysis of ASRS incident data. Although lacking some of the features of a more traditional research effort, QRs are capable of providing a useful and quantifiable "snapshot" of topical issues. This analysis made the overall assessment that TCAS II has definitely enhanced safety, but still has a number of technical and human-machine interface problems. Note: As all TCAS units in current use are TCAS II systems, TCAS and TCAS II are used synonymously in this review. This is the good news about TCAS, but these benefits have not been gained without some side-effects. Most TCAS II issues reported to the ASRS encompass anomalous or erroneous operation of TCAS II equipment, TCAS-induced distraction, airborne conflicts provoked by TCAS, and non-standard use of TCAS. Controllers obtain altitude information about traffic displayed on their radar from the Mode C function of the aircraft's radar transponder. If Mode C provides erroneous altitude information, the controller will see an incorrect altitude displayed on the scope. Should a controller note a disparity between displayed and assigned altitude, he/she will ask the flight to confirm its altitude, and may request that the flight crew reset their transponder, use a different transponder, or disable Mode C.
"Our flight [air carrier X]...was at flight level 260...We observed a TCAS II advisory [TA] of traffic at 12 o'clock, 1,000 feet above at about 15 miles on an opposing heading. Shortly after, we observed traffic on [the] TCAS II display descend from 1,000 feet above to 500 feet above. TCAS II commanded a descent of at least 2,000 feet per minute to avoid traffic. Pilots frequently cite TCAS II related auditory and workload interference with normal cockpit duties, as is noted in the following report from an air carrier First Officer. Many TCAS incident reports received at the ASRS allege that pilot response to erroneous TCAS commands has promoted a conflict where, initially, none existed. Consider the following near mid-air collision (NMAC) where the TCAS II RA may well have been triggered by the high climb rate of air carrier (Y). In a recent congressional subcommittee hearing on TCAS II, Air Line Pilots Association (ALPA) President, J. Randolph Babbitt, testified, "Line pilots have strongly endorsed TCAS II and would emphatically resist any efforts to reduce its operational effectiveness." The National Air Traffic Controllers Association (NATCA) President, Barry Krasner, countered at the same hearing that "...TCAS [II] is highly disruptive to the air traffic control environment." The U.S. Government's General Accounting Office, in a summary of TCAS II surveys, detected that controllers have strong "negative" feelings while there is widespread pilot acceptance of TCAS II. The pilot community, particularly ALPA, sees TCAS II as a "...last ditch, they-may-have-hit-if-something-is-not-done, piece of equipment..." that gives the pilot a precious way out if "...the ATC system has somehow unaccountably failed." Both the FAA and the airlines exhort TCAS II equipped flight crews to "...follow the RA..." when it is contrary to ATC instructions. In contrast, NATCA's Krasner ominously warns that TCAS II "...is an airborne system that works improperly and actually erodes an already precarious margin of safety in the skies." NATCA favors a moratorium on further TCAS II installations and calls for restricting alerts to TAs only. ALPA recognizes that TCAS II is not without its technical faults, but considers its enhanced safety value well worth the "growing pains." The issue appears to be settling down to two strongly different viewpoints: 1) NATCA wants the decision to separate aircraft to remain in the hands of the air traffic controller "...who has verified information to provide required separation;" 2) The pilot community wants an independent airborne collision avoidance system that leaves the decision for last-minute collision separation action in the cockpit. The majority of TCAS II reports being received at the ASRS are favorable to the technology. According to on-the-scene reporters, TCAS II has prevented numerous near-midair collision situations and averted potential air disasters. However, there is growing friction between flight crews in compliance with TCAS II RAs and wary air traffic controllers. TCAS II is a developing challenge for both constituencies. In the interest of serving the aviation public, it behooves pilots and controllers to find an operational accommodation that masters the safety benefits of TCAS II. The information provided thus far in this article has been qualitative in nature; we will now provide a quantitative analysis of the 1,997 TCAS II related incident reports that have been received at the ASRS. Approximately 7 percent of these reports are from controllers, and the remaining 93 percent from pilots. As the air carrier and business aircraft fleets moved to comply with FAR 121.356, the reporting of TCAS II incidents increased significantly between 1990 and 1992 -- as can be seen in Table 1. Table 2 provides the airspace involvement for all ASRS database TCAS incident records -- for the aircraft of the principal reporter of an incident (primary aircraft). (Note that airspace categories are not necessarily mutually exclusive.) The single airspace category in which the majority of TCAS incidents occurred was in "Other" Controlled Airspace, meaning within controlled airspace but outside of TCAs, ARSAs, etc. The next most commonly involved airspace was in Terminal Control Areas (TCAs), while the third most common airspace category was in the Positive Control Area (above 18,000 feet). Table 3 indicates the flight phase of ASRS database TCAS incidents. (As with airspace categories, ASRS flight phase categories are not necessarily mutually exclusive.) The flight phase most commonly cited for the primary aircraft was Cruise. Note, however, that if the climb and descent phases of flight are combined, they total 1,151 citations -- 30 percent more than the cruise phase. Now lets look at the 170 randomly selected records that comprised the QR data set. There were 159 incident reports by pilots, and 11 controller reports. In 153 of 170 incidents, flight crews received both a TCAS II TA and RA (84%). For those 153 records, Figure 1 shows what pilot avoidance action was based on. Note that in the majority of incidents, avoidance action was based on the RA. In 111 of 170 incidents, the reporter provided information about visual acquisition of their TCAS II targets. Figure 2 shows when and if traffic was acquired visually by the flight crew. In 68 percent of incidents, the flight crew never sighted their traffic. Figure 3 shows whether or not ATC observed the TCAS II traffic for the entire 170-report QR data set. In the majority of instances, ATC did "see" the traffic. Figure 4 indicates that ATC provided traffic advisories in 136 of 170 TCAS II incidents. There were 34 instances in which ATC response to a potential conflict was unknown. According to reporters, ATC did not provide a traffic advisory in 48 of 136 TCAS II incidents (35 percent). Table 4 shows how reporters felt about TCAS II. Reporters could express more than a single opinion; thus there are 301 individual responses (citations) from 170 reports. In 94 instances, the reporter stated or implied that TCAS enhanced safety. This table provides the key findings of the Quick Response analysis effort, indicating that reporters in the 170-record QR data set strongly endorse the safety value of TCAS II. However, this finding is undoubtedly influenced by the relatively large percentage of these reports that come from pilots rather than controllers. Table 4 -- TCAS II "Quick Response"
TCAS II "Saved the Day"
The ASRS analyst staff are certainly no wiser than those in government and industry who are grappling with TCAS II issues, nor would we make suggestions that conflict with TCAS II standard operating procedures. Nonetheless, review of TCAS II incident reports does suggest that there may be ways to deal with, or even avoid a TCAS incident. High rates of climb and descent, particularly in auto-flight aircraft, are often implicated in erroneous TCAS II activation. Controllers should be alert to the possibility of a TCAS II RA for an aircraft while it is in its final 1,000 feet of climb or descent and in proximity of traffic. Providing traffic advisories in a timely manner to TCAS-equipped aircraft in climb and descent in the terminal area, even though separation has been previously established, may help reduce the number or severity of TCAS events. Controllers must remember that both FAA and company TCAS II instructions stress pilot compliance with RA commands. Venting anger or annoyance at pilots can heighten tensions and promote distraction. As with any technology, TCAS II is not foolproof. Be alert for anomalous operation of the unit, particularly in proximity to terrain. TCAS incidents are most likely to occur in the climb and descent phases of flight. It is recommended that flight crews, where possible, reduce vertical rates when closing on target altitudes to those recommended in the Airmen's Information Manual (AIM). Auto-flight aircraft with programmed high rates of vertical speed may be particularly prone to erroneous TCAS "triggering." Alerting ATC prior to or concurrent with executing your RA response, whenever cockpit workload and frequency congestion permit, could help controllers reduce the impact of the avoidance maneuver on other traffic in the area. TCAS II works well at providing separation in conflict situations. In a number of instances where pilot response to TCAS RAs has been delayed or tentative, close air-misses have resulted. This suggests that, once the flight crew has decided to respond to a TCAS II alert, their response should be immediate and complete. Excessive responses to TCAS II alerts have also caused many problems. It is suggested that pilots limit their response to RAs to that commanded by their TCAS II equipment. Exceeding TCAS II vertical commands into the next cardinal altitude could provoke an unintended near miss or loss of separation with other traffic. TCAS II, in the opinion of much of the pilot community, has been instrumental in reducing risks associated with airborne conflicts. Many in the ATC community, however, feel that TCAS II has increased workload and derogated the primary responsibility of the air traffic controller -- that of providing traffic separation. These sharp divisions between the pilot and controller constituencies, with resulting friction, may, if not adequately managed, result in an overall negative impact on flight safety. For some controllers, it is inconceivable that ATC should not be "in-the-loop" prior to or during TCAS activation. As industry and government grapple with TCAS problems and issues, it is important for pilots and controllers to jointly understand and manage the TCAS environment -- so that the genie remains under control. Reproduction and redistribution of ASRS Directline articles is not only permitted--it is encouraged. We ask that you give attibution to ASRS Directline, to the Aviation Safety Reporting System (ASRS), and of course, to the authors of each article.